55 customers are using Pop Up Master component for Joomla! Easy Installation and Configuration Each Parameter well-explained, all you need to do is rolling your mouse over the parameter title. 3 Main Themes - that can be increased to millions! All depends on your imagination! You may create thousands of pop up designs by editing the module parameters! Colors, positions are all editable. Whenever you need help, just ask at out support. You may also use the previously created designs from us! If you have any requests for any design just ask us! You can create multiple pop ups at the same page! You may set session cookies to prevent to show the same pop up multiple times in the same session! Session cookies are expired when visitor close the browser. Show popup only at some pre-defined number of visits, more, less, equal and more or equal or less. Lets say you want to show a pop up message when a visitor come to the same page 3 times. Set Visit Cookie to YES, Visit Count 3 and Revisit Show Logic to Equal. Now you are able to show your message to a visitor when visiting the page 3rd time. You may also show to only a single user or multiple users! Lets say you want to show a message only to your Customers Group or to only Users x,y and z then simply define this at users section in pop up parameters. You may deifne any pop up position on the page - TopRight, TopLeft, BottomRight, BottomLeft, MiddleRight, MiddleLeft, Center or any other position! Any Color and 10 Levels of Opacity for the Overlay! Custom HTML for sending - success events! Save Emails to Custom Component in to different List Levels! Attach Files and send email to subscribers! - That is new at Joomla! An Amazing Marketer Technique! Send Custom Emails to Subscribers! When you create a popup as an optin form, you can save the email to the selected list. You can create Email Lists at Component Pop Up Master and save emails to the selected lists! You can manage Emails at Component Pop Up Master. and save emails to the selected lists! 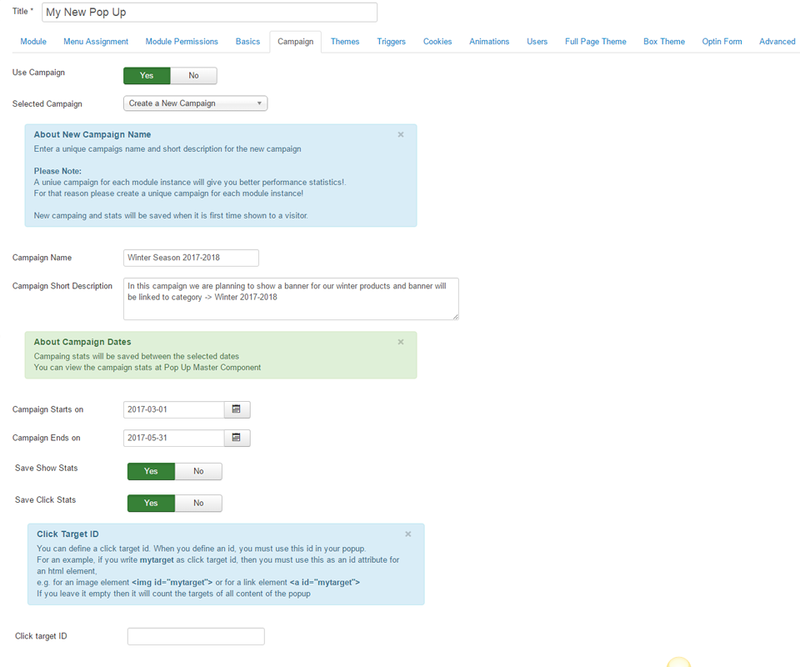 Manage emails, view the submitted url, ip address, date submitted at email / lead detail page. Export emails by using the filters! You can export Emails at Component Pop Up Master - Export Manager and Download the CSV File by different filters. 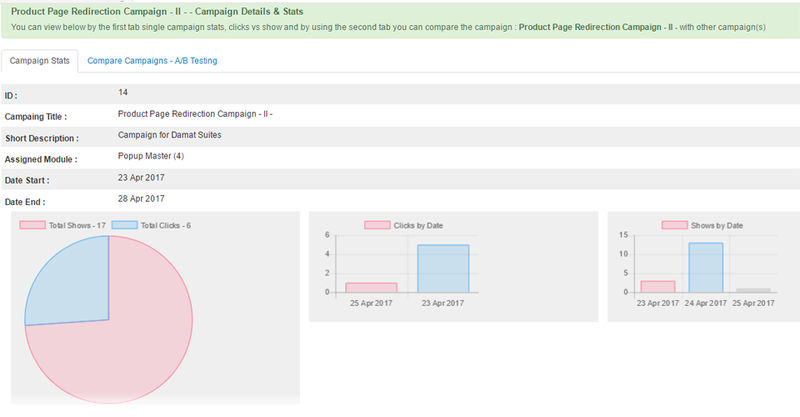 You can create campaigns for each pop up instance and get the campaign data, stats to view the performance and compare the campaigns! You can compare campaign performances! This is extremely important, you can create several campaign instances for the same page and view the performances and decide for the best one! As I am building a website for an organisation, would I get a discount? We sent a coupon for your organisation, please check your email. With the cookie pop-up, I want to use it for news alert or any kind of announcements type. Of course it may annoy users if it pops up every time but can I control it often it displays i.e. one session per client? You can use the cookie settings to prevent annoying users. You may set session cookies to prevent to show the same pop up multiple times in the same session. In the same time there is an option of visit cookies, to show popup only at some pre-defined number of visits, more, less, equal and more or equal or less. Another good option is user, user group options, You may show popups to a user group or multiple user groups, you may also show to only a single user or multiple users!